When Scott Schwartz, guitarist and vocalist of The Shadowboxers, describes his band’s reaction to Martin Scorcese’s Shine A Light, the Rolling Stones rock doc filmed at the New York’s Beacon Theater, it’s one of disbelief. The laughter indicates that the rest of the band agree with his appraisal–but the anecdote is more than a fond memory. Schwartz gets a round of applause when he finishes recounting the awe he felt as he is standing on stage at the Beacon Theater, clutching a microphone as the opening act for the Indigo Girls’ fall tour. The journey to that point started over a year ago, in Atlanta, in the least likely of places: A Passover seder. Since the college student was the youngest in attendance, he sang the four questions. Sitting at the same table was Emily Saliers, one half of the Atlanta-based Indigo Girls. Afterward, the two began talking about music and when Schwartz picked up a guitar, it came to light that he was in a band. Schwartz, by that time, had been jamming with friends Matt Lipkins (on vocals and piano) and Adam Hoffman (on vocals and lead guitar), whom he met while attending Emory University. Saliers decided to head to Schwartz’s upcoming gig with the Shadowboxers at Emory, also her alma mater. She found that the quality of Schwartz’ voice isn’t an exception; rich vocals are practically a rule for the band. Her manager listened, and agreed. They both heard a mix of influences. The band admits to borrowing from folk and funk, and copping a stadium-rock, Coldplay kind of sound while focusing heavily on rhythms that groove. Schwartz and Lipkins list John Mayer (who got his start in Atlanta) and Stevie Wonder among their musical inspirations, and the influence isn’t hard to hear. New listeners are quick to mention Maroon 5, but that comparison downplays the complexity of the music. Most songs feature The Shadowboxers’ signature three-part vocal harmonies from Schwartz, Lipkins and Hoffman. They rise above the mix in the band’s recordings, and the three voices are consistently pitch-perfect in a live setting—a difficult feat in itself. Bassist Ben Williams and drummer Jaron Pearlman round out the group by giving the music a deep pocket that makes syncopation and rhythmic stops a head-bobbing, musical experience. “We just like coming up with different ways to keep everybody on their toes,” says Schwartz of the band’s sound. But the band makes a definite distinction between complexity and accessibility. “We’re trying to write songs that musically, are somewhat advanced, but to listeners sound just like a pop song,” Hoffman says, after describing “Vienna,” a song they co-wrote with Saliers whose main sections are in odd meter. They also wrote “She Forgives” together, on which Saliers helped to hammer out the emotional direction of the lyrics with the chord progression that Hoffman composed. The benefits of touring and writing with the Indigo Girls—who Pearlman says “are like really cool aunts”—are obvious for a band that released their first EP only months ago, as they graduated from Emory. But the relationship between the two bands is surprisingly symbiotic. As The Shadowboxers watch in awe as their headliners bring a fresh take to songs they wrote decades ago, Saliers admits that sustaining a career of that length is not a solitary pursuit. Saliers has invited the band to record with the Indigo Girls, and they lend their three-part harmonies to the title track from 2011’s Beauty Queen Sister. But the justification for her approval lies in The Shadowboxers music, which achieves the difficult goal of sounding fully original in an industry saturated with mash-ups and programmable beats. Though mixing styles and challenging audiences are conscious goals, the band’s bassist describes a more organic process that accounts for their captivating sound. 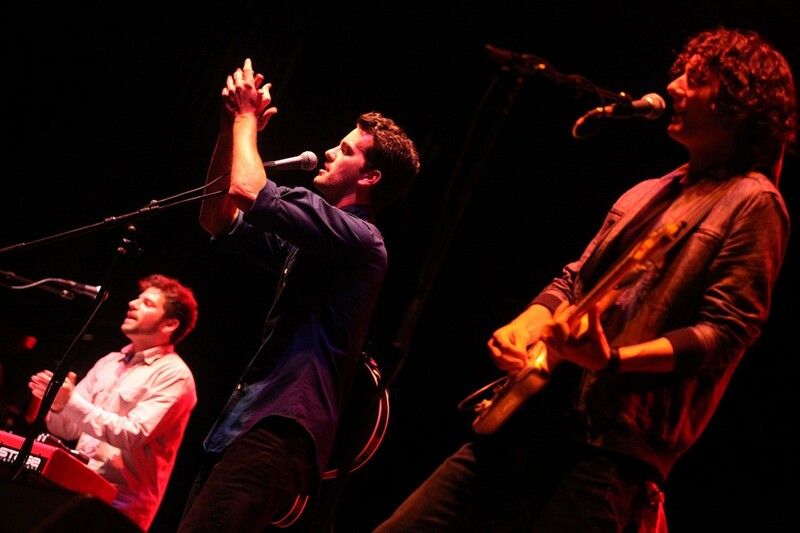 The Shadowboxers perform “Fixer” at the Variety Playhouse in Atlanta, GA on March 10, 2012.